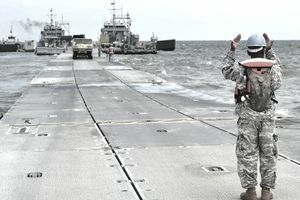 While the Army may not be the first branch of the service you think of when it comes to boats, ocean-going and harbor craft support its operations at home and abroad. There aren't a lot of soldiers who end up spending their careers aboard a boat, but this job fits the bill for those who crave a little time on the water. The Watercraft Operator, which is military occupational specialty (MOS) 88K, navigates, pilots and maintains Army watercraft. These vessels range from small speedboats to tugs to larger ships. Many enlisted soldiers choose this job because they’re likely to remain with their unit for a long time since there are limited destinations for this MOS (and one of those destinations is Hawaii). These soldiers use a variety of tools to pilot Army boats, including electronic positioning systems and handheld navigation devices. They also rely on more traditional practices, like standing watch, to oversee cargo operations and to supervise other soldiers. They dock and undock vessels, drop and weigh anchor, interpret code signal flags, and send and receive messages via radio, beacon and signal flag. MOS 88K is also responsible for operating and maintaining lifeboats and firefighting equipment, keeping charts, publications and orders well-organized and documented, and keeping the vessel's logbook. And as one might expect, these seafaring soldiers navigate boats, and tow barges in harbors and through intercoastal waterways. They'll also do smaller tasks aboard their ships, including cleaning compartments and decks, maintaining equipment such as winches, hoists, davits, and capstans, and keep surfaces freshly painted. Finally, these soldiers are charged with overseeing subordinate soldiers both aboard the ship and elsewhere. Job training for a watercraft operator requires ten weeks of Basic Combat Training and six weeks of Advanced Individual Training with on-the-job instruction. Part of this time is spent in the classroom and part in the field, which in this case will mean time aboard a watercraft. You'll learn boat-handling techniques and standing-watch procedures, how to use navigational and communications systems aboard vessels, navigational mathematics and how to maintain and record logs and other messages. To be eligible for this role, you'll need a score of at least 99 on the mechanical maintenance (MM) section of the Armed Services Vocational Aptitude Battery (ASVAB) test. This position doesn't require a Department of Defense security clearance, but the normal color vision is required. You'll need to have uncorrected vision of 20/200 in each eye that corrects with lenses or eyeglasses to 20/20 in one eye and 20/40 in the other. Some of the skills you learn in this Army job are military-specific but that doesn't mean you won't be prepared for the civilian workforce. You'll be well-equipped for a career in shipping, or working on a cruise ship, tugboat or ferry. In addition, you’ll be able to consider a future as a pilot, harbormaster or marine resource enforcement officer.